When I made my rounds on Friday, I picked up a bottle of Iron City’s newest burst of brewing genius — IC Light Mango. My beer folks had been waiting for this one since news of it came out a few weeks ago, and, yeah, I need to try one — one — just out of morbid curiosity. And tonight was the night. I had already had a solid western Pennsylvania kind of evening — brats from Parma in the Strip, with a glass of White Magick from Voodoo in Meadville — so something from Pittsburgh’s oldest brewery — sort of — was the perfect capper, right? Here we go. 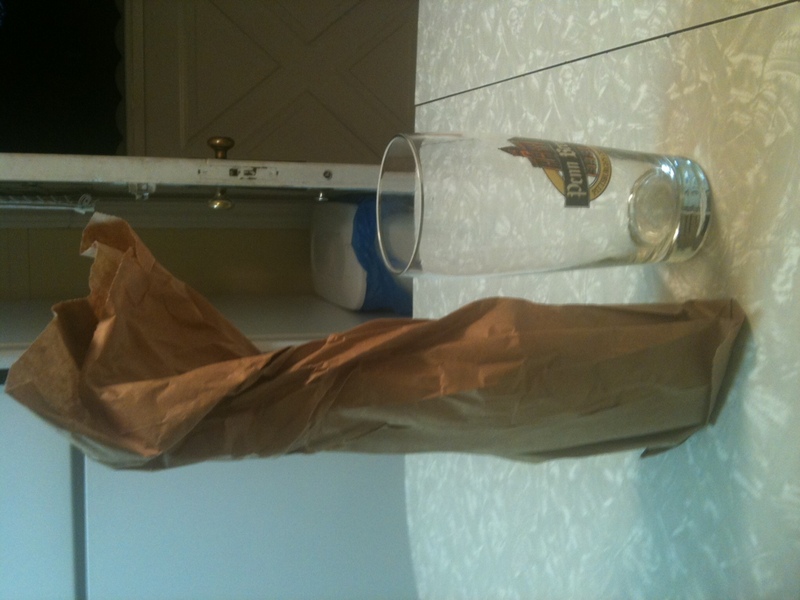 The bag was appropriate, I thought, probably more than the Penn Brewery glass. Let’s take a closer look. Hm. Looks like a funky Coors Light. But I’m committed here, so let’s see what it looks like in the glass. 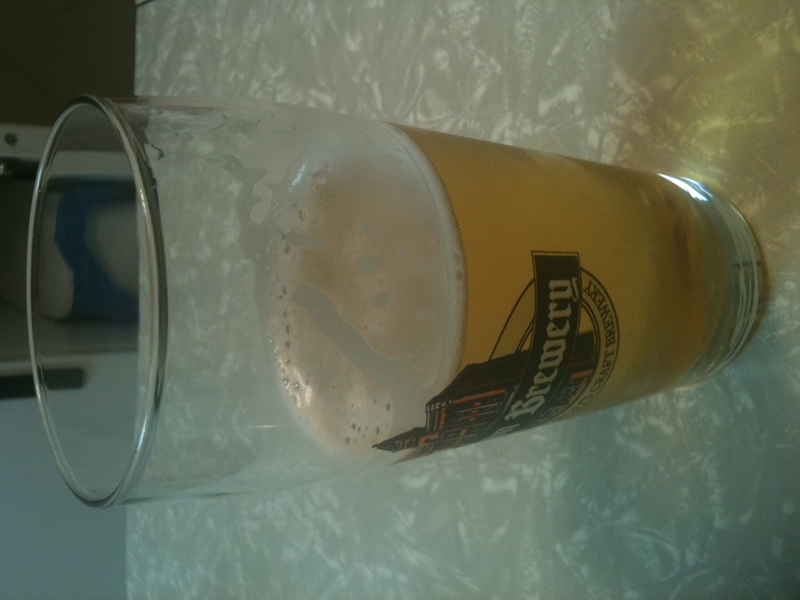 After a hard pour, that head held on for a while, thereby exceeding my expectations. But even more important than the look? The smell. Holy mangoes, Batman — the powerful fruit on the nose promised something that would taste like fruit juice. Maybe not so good for a beer, but I was hopeful. The nose promises a fruit bomb, but the flavor doesn’t match the nose; in fact, it doesn’t even come close. Going in, I didn’t expect to like this, but I was expecting a cloying, fruity mess, and what I got instead was actually just kind of dull: a hint of the promised mango flavor, and nothing that suggests that any hops or barley had anything to do with the production of the beer. Here’s the odd part. I hate this kind of marketing crap, when a brewery blindly follows trends in hopes of scoring a winner. 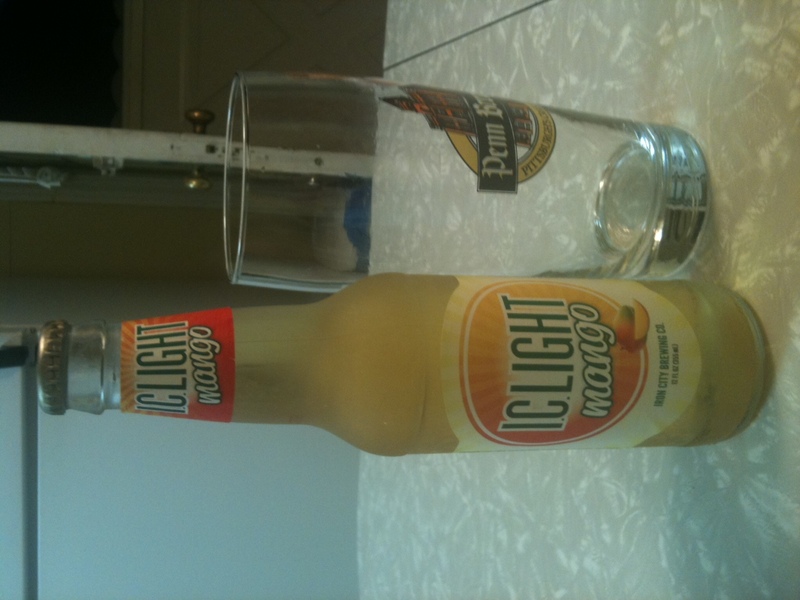 But while I wouldn’t recommend IC Light Mango, I didn’t hate it. It is bland, inoffensive and will probably sell by the truckload for the rest of the summer. And that’s probably my biggest problem with IC Light Mango — there are a bunch of people who will buy this and think they’re being adventurous. And that’s a bummer, especially when there are so many really good fruit beers out there to try. The next time East End releases one of its berry-rye concoctions, get yourself to the brewery in a hurry; they go quick, because they’re that good. If you want to try IC Light Mango because you’re curious? Fine — go have a taste and see what you think. But please think twice about rushing to buy a case, just because it’s the newest thing from Iron City — you’d be much better off spending your money supporting brewers that put some thought and care into their beer, rather than those that chase marketing numbers instead. No mango beer for me, or any others in fruity or spicy flavors. Clove beer. I call it ham beer. Yuck. Looks better in the glass than in the bottle. To quote dearly departed Myron Cope, “Yoi and double Yoi!”. 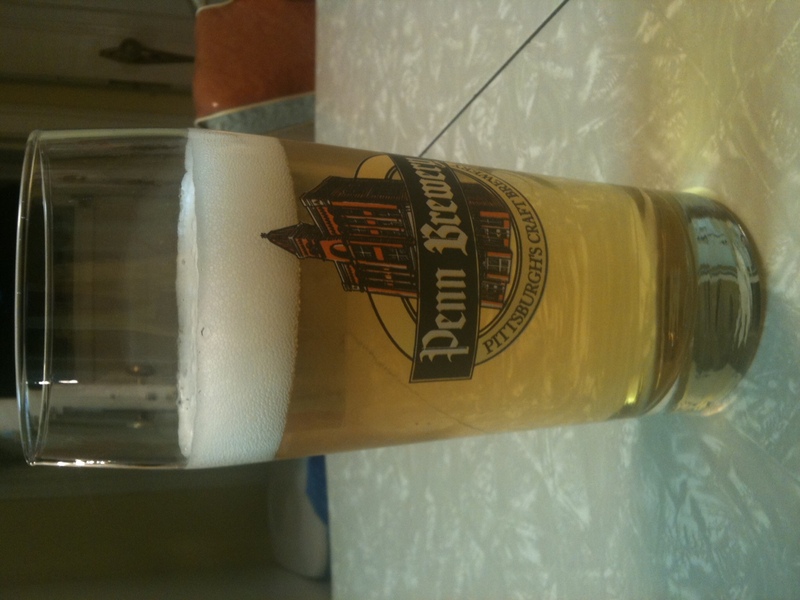 Look, I drank more than my share of IC Light in the 3 yrs I lived in the Burgh, but what an awful idea. Sadly, Pounder is directly on point here. It will sell like pierogies at the Bloomfield Bridge Tavern. UC, you are a brave man. IC light mango?!? If I saw that in the beer cooler, I’d be looking for hidden cameras, and be fully expecting to get punk’d if I reached in and touched it. Gotta admit, I’m not a big fan of fruit beers or beers requiring the addition of fruit. Yeah, I’m looking at you, Corona. I like the German purity laws (malt, hops, yeast and water). There are over 25 styles with limitless variations that comply with the purity laws. That’s a lifetime of drinking with nary a mango in sight.